The Atlantic Christian Ashram began in 1969. This 5-day retreat is held each year in July at the Berwick Campgrounds in Berwick, NS, Canada. The campgrounds are rented from the United Church Camp Meeting Association and consist of over 25 acres on the edge of the town in the beautiful Annapolis Valley. 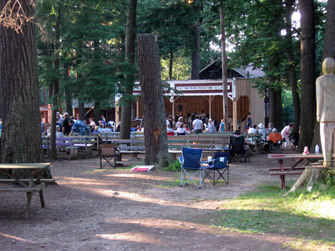 It is a unique setting beneath a canopy of 100-foot tall hemlock trees. What is a Christian Ashram? We are pleased to welcome Brother Daniel Cormier as our Evangelist at this year’s Atlantic Christian Ashram. Pastor Daniel Cormier was born on Vancouver Island but has spent the majority of his life in the Atlantic Provinces. He is married to, Gina, and they have a son, Caleb (daughter-in-law, Jill), and three daughters, Bethany (son-in-law, Joe), Rachel, and Anna, as well as two grandchildren, Ruth and Louis. Daniel studied at Prairie Bible College graduating in 1998 and upon further studies at Acadia Divinity College and Gordon-Conwell Theological Seminary he was ordained in 2003. He has served in pastoral ministry for twenty years in New Brunswick and Nova Scotia. His ministry passion is to lead and be a part of a church that loves to glorify and enjoy God through biblical, gospel-driven life and mission with Jesus. He confesses to a weakness for books, boats, and coffee, and cherishes time with family, friends, listening to music, enjoying sports and the great outdoors. We look forward to his ministry as the Evangelist at this year’s Ashram. We are pleased to welcome Brother Darren Millett as our Bible Study Leader at this year’s Atlantic Christian Ashram. Darren is a graduate of Acadia Divinity College with his Masters in Divinity, and has an undergraduate in Business Administration from Acadia. Darren worked for Sobeys at their head office in Stellarton NS for 15 years before responding to a call to pastoral ministry. Since graduation he has been six years as senior pastor at St George Baptist Church, in St George NB, and is in his fifth year as Pastor at New Life Community Church in Hatchet Lake, located just outside Halifax NS. Darren has a love for digging into the scriptures, and to see the Holy Spirit at work through the Word to transform lives. Darren and his wife Maurica have been married for 21 years, and they have 2 girls: Maria 14 and Rebecca 11. We look forward to his ministry as the Bible Study Leader at this year’s Ashram.